The idea to go to Nepal came to me when I was looking for somewhere to travel to this summer. 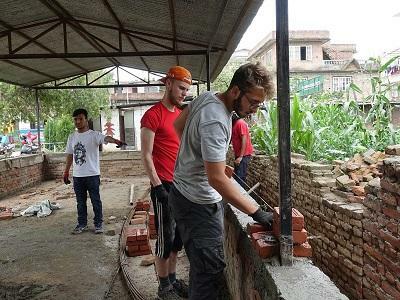 Having volunteered with Projects Abroad before, and having done overseas building work, combined with the need for workers to help rebuild schools after the most recent earthquake, the Building placement in Nepal was an obvious fit for me. Having been away with Projects Abroad more than once now, I can safely say that I will look to volunteer with them again for my next travelling plan. The five months between applying and leaving flew very quickly and soon I was on my way to the airport, ready for the three flights I had ahead of me. Upon touching down at the airport, the support and advice I had been given came in handy. This advice helped me navigate this new building, with its unique aspects such as immigration controls and increased security checks. However once through, and despite it being daunting, the airport pick-up was easy enough and I was then driven to Hotel Prince for a night to relax and adjust. This chance to adjust was greatly welcomed, as the shock and adrenaline of being in a completely different country sets in immediately. Specifically, as I was picked up from the airport, I was met with a car containing rugs, alters and necklaces, letting me know that I was somewhere I had not experienced before. This, along with the wonderfully chaotic traffic and a surprising swerve out of the way of the sacred cow, were all memorable aspects of my journey. My project work was on a building site, where I helped with rebuilding a section of a school that had been destroyed in the earthquake three years ago. The project at this particular site had not been set up for very long and so a lot of our work was filling in foundations and beginning to layer up walls. 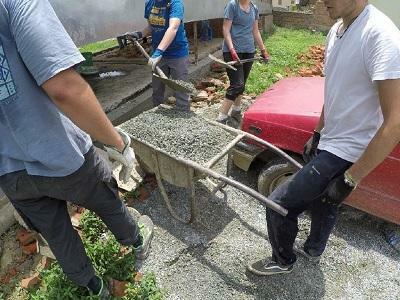 Every day, we made at least two batches of concrete by hand. This involved gathering barrows of stones, sand and cement, and separating and mixing it all together before adding water little by little. This was tiring work, but essential and fulfilling too. This was a hugely enjoyable experience and enabled us to get into a routine, which came in handy when adjusting to a new country. 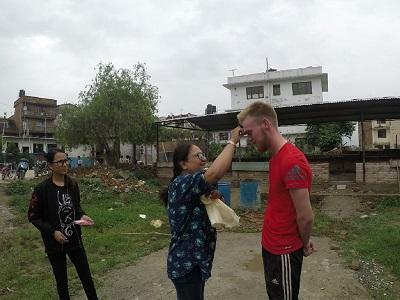 Through this routine, I started to get used to my Nepali life and what that entailed. From being picked up by the bus and driven to work, all the way to the curfew time in the evening. This includes morning routines, breakfast, work assignments, lunch and then the afternoon work, before having the evening to ourselves. We usually spent our evening relaxing at one of the local cafes near our house in the Bagdol area. I spent my time living with a Nepali family. Susmita, my host mother, cared for us along with her own son and daughter, aged four and six. 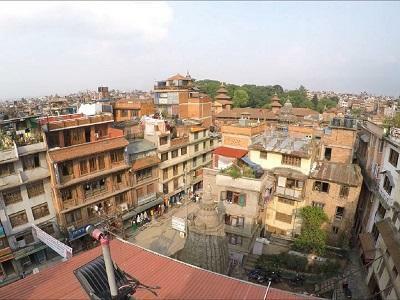 I really began to feel comfortable and at home in the narrow four-story house that is typical of Kathmandu’s irregular skyline. We would eat breakfast and dinner here, unless we chose to go out for food in the evening. A selection of what we had for breakfast included: Juju Dhau (a special yoghurt prepared in the Bhakatpur region of the city), curried vegetable and potato soup, and lentil daal, which is also a feature of the famous daal bhat, a dish that is eaten every day by some families. This dish combines a vegetable curry with sides of rice, a lentil soup-like dish, yoghurt, naans and greens. For a non-curry eater, this was something that challenged my preferences. 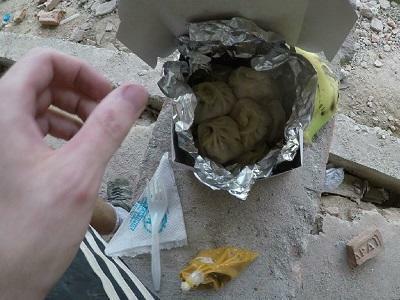 However, what really piqued my interest was the dumplings stuffed with curried chicken known as momo. These are served with a cold curry sauce and are a traditional Tibetan dish that has been adopted into Nepali culture through many centuries of migration. Our workday lunch would come delivered via motorcycle in a paper box, and it was far better than any MacDonald’s or KFC I have ever had. I thoroughly enjoyed my time in Nepal and I have fallen in love with the country. My time there, although short, left a lasting impression and I am already looking at when I can return. Again, Projects Abroad were the perfect organisation to go with and the freedom and care they provided was the perfect balance. I would absolutely recommend this project to anyone interested.